Originally published November 2, 2018. When you come to yoga practice, you bring your mat; you assume the poses; you breathe. Yet there is so much more to yoga than what happens in class. Way more twists and turns than Eagle pose! There is a code of conduct in yoga, called the Yamas and Niyamas. I like to call them the Ten Commandments of Yoga, and they serve as a road map to help navigate life. Simply put, they are the do’s and don’ts of a practicing yogi’s life. When you are practicing “right action” through the Yamas, you are at peace with the world. When you practice “right thought” through the Niyamas, you are at peace with yourself. One of the Niyamas, known in Sanskrit as Santosa, means “contentment.” For me, contentment is the ability to be happy with what I have, to live in the moment (no matter the moment brings), and be grateful . It’s being balanced when things are great, and balanced when things are lousy. Through the power of contentment, happiness becomes a choice – keeping us from lacking nothing. As the ancient text of the Yoga Sutras states: from acceptance, the disciple gains happiness supreme. An esteemed yoga teacher, Rolf Gates, author of the book Meditations from the Mat, uses this prayer to access his contentment: God, thank you for bringing me here. Rolf whispered the prayer every time he took a chair at an AA meeting, saying it felt like sanity to him during a challenging time of his life. Such simple, yet complete, words. I used it as my mantra every time I took my own seat in a chemo chair. God, thank you for bringing me here. Through that, I learned that gratitude turns whatever we have into enough. And once I accepted that cancer was my “new normal”, the prayer started showing up everywhere for me – much like it did for Rolf. I say the prayer while walking my dogs in Bradley Woods or paddle boarding with my husband on Lake Erie. It’s on my lips when I teach chair yoga at a nursing home and stay for afternoon coffee with “girlfriends.” I whispered it as we took our seats at Chez Francois for my 50th birthday dinner surrounded by close friends. I repeated it … and repeated it … and repeated it… during the grand opening weekend of my second yoga studio in Catawba. I say it every time we host another fundraiser for a good cause. It is my way to contentment, too. 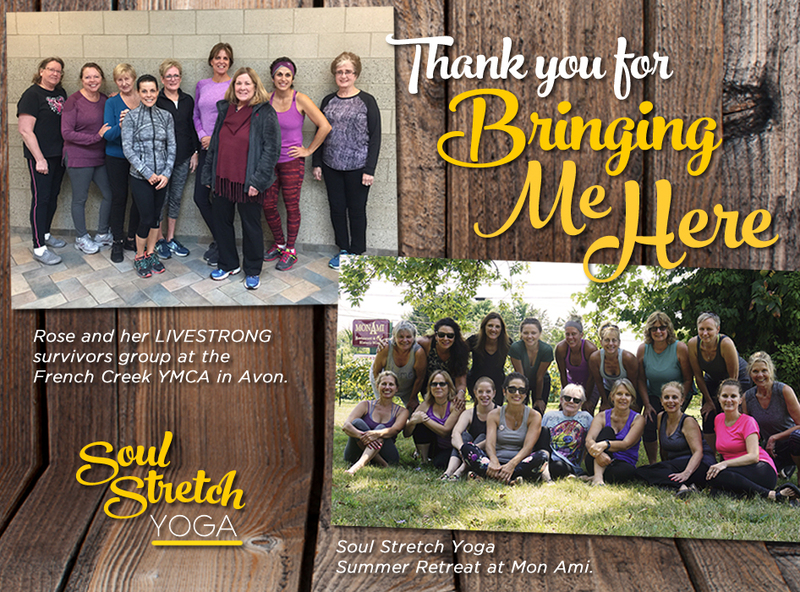 More recently, I’ve been thanking God for bringing me to a cancer survivors group in Avon – my newest cancer posse. In 2008, the national YMCA partnered with LIVESTRONG (the organization founded by fellow cancer survivor, Lance Armstrong) to provide a free 12-week program to cancer survivors like me. It’s purpose is to help tired, burned out, ragged cancer survivors move on to healing and health. My group meets twice a week for 90 minutes at the French Creek YMCA. Several of my LIVESTRONG coaches are cancer survivors themselves, and they’re super empathic to the emotional journey of surviving cancer as well as the unique physical needs some treatments cause. Even more importantly, my coaches foster a warm spirit of community and companionship among the group. It is a blessing. LIVESTRONG is offered at NO COST to adult cancer survivors at the French Creek YMCA. Members of the group do not have to be members of the Y. Group members have use of the entire facility and a variety of fitness classes. LIVESTRONG has helped thousands of survivors move beyond cancer. Namaslay. For more information on how YOU can participate, please contact Diane Hallagan at dhallagan@clevelandymca.org or call 440-934-9622.